Thank you to everyone who came out to our Fall Rush Week! 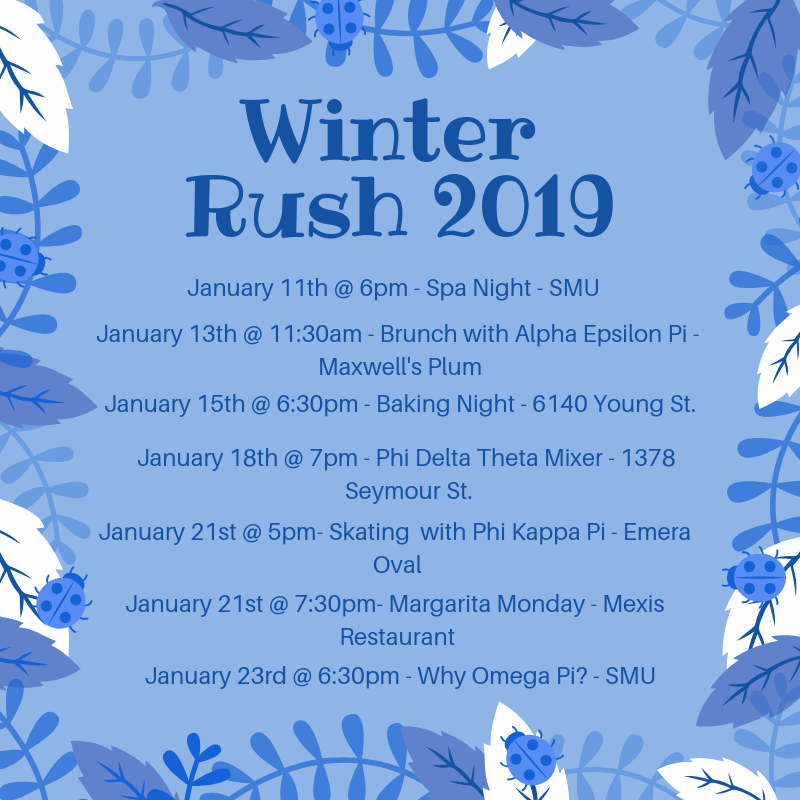 We'll be back in January with our Winter Rush Week 2019! Interested in joining Omega Pi or just want to come out to some fun events? Check out the Omega Pi Rush page on Facebook or follow us on Instagram. Starting on January 11th, 2019 we will be hosting exciting events so potential sisters can get to know the sorority. Check below for the upcoming rush events! You can also contact our rush chair Shannon Havill for more information! ​Can't fit these dates into your schedule? ​Don't Worry! if you are still interested in Rushing Omega Pi, contact Shannon via text message to get in touch and meet up when it is convenient for you. ​ We can't wait to meet you all! Keep an eye out for more information on our Facebook page and Instagram! What do you mean, "Rushing?" "Rush" is our form of recruitment. We hold a Rush period twice a year, within the first month of each semester (fall and winter). Rush is not only a time for you to get to know the Sisters and more about Omega Pi, but is also a time for us to get to know you. We encourage you to try to attend as many Rush events as you can; this not only maximizes your chances of being asked to Pledge, but helps you create friendships among the Sisters and your potential Pledge Sisters. How do I "Rush" Omega Pi? Easy, come out to some of our Rush events! 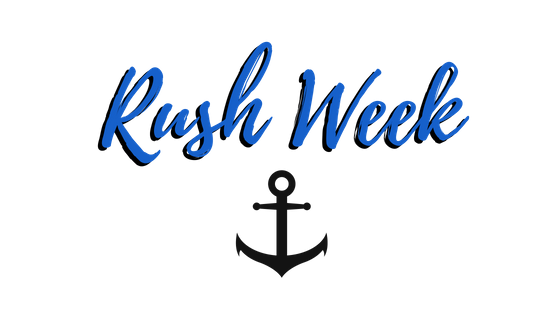 Rush lasts one-to-two weeks and is filled with various events designed to help introduce you to our Active Sisters (and often times some of our Alumnae!) Rush includes events with the Sisters of Omega Pi and events in conjunction with other Greek Letter Organizations (GLOs) on campus. Omega Pi strongly believes in Individuality, so we offer a wide array of events, hoping there's something to appeal to everyone's tastes. We post the details of all of our Rush events on the Rush Facebook page. If you're interested in Rushing, you should contact our Rush Chairs as soon as possible! First of all, this is your chance to meet the Sisters, get to know about Omega Pi and see if this is the right Sorority for you. Secondly, it allows the Sisters to get to know you! If we think you're a good fit for Omega Pi, you'll be invited to Pledge. Rushing gives you the opportunity to ask any and all questions you have about the Pledge Process (you can also visit our Pledging FAQ). Rushing Omega Pi allows you the chance to witness the Bonds of Friendship that have formed between the members of Omega Pi. Many Sisters of Omega Pi think of the Sorority as their second family, and the friendships that are created within our Sorority do last a lifetime. Not only will you make friendships that will last a lifetime, but the Sisters will become resources to help you throughout all stages of your life - from helping you get a job, tutoring you, letting you crash on their sofa whenever needed, being a shoulder to cry on and doing whatever they can to guide you through life. By checking out our Rush Period, you're taking the first step to gaining the sorority experience. What happens after Rush ends? Once Rush has ended, you may be invited to pledge Omega Pi Sorority. You do not have to accept this invitation, but if you do, you're taking the next step on your way to becoming a Sister of Omega Pi. For more information on Pledging, or are interested in rushing for the Omega Pi Sorority, email our Rush Chairs and be sure to check out our Pledging FAQ. Do I have to join Omega Pi after Rush ends? Certainly not! Although we hope that everyone we extend an invitation to Pledge accepts, we understand that not everyone will. Whether you decide you don't have time this semester, or if you just decided Omega Pi isn't the right fit for you, you are not obligated to Pledge Omega Pi. Additionally, we openly inform all of our Rush that there are two other female GLOs in Halifax, and encourage you to Rush them as well (you don't have to Rush just one organization, you can Rush all three at once). If you don't feel Omega Pi is right, we want you to find the best fit for you. If you are a female (or identify as such) and attend one of Omega Pi's Member Universities (listed below) you can Rush!